A nice feature story on Peter Leigh and Post Office Farm Nursery (and Hellebores) from ABC Gardening Australia program which was aired in July 2018, click here to see the story. An earlier ABC Gardening Australia feature on Peter Leigh and Hellebores which was broadcast in June 2009, click here to see that story. 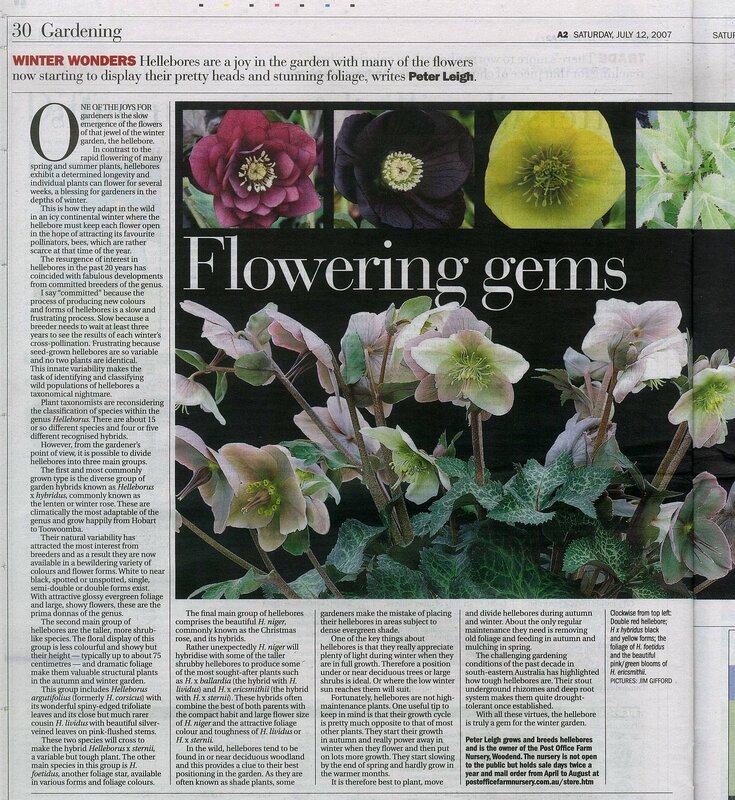 An article by Peter Leigh about Hellebores published in the gardening section of the Melbourne Age on Saturday July 12 2008. Another longer article on Hellebores published in the Winter 2010 edition of Your Garden magazine. Click here to view a PDF file of the article. A more recent article from The Age/Sydney Morning Herald (published July 2018) featuring Peter Leigh and Post Office Farm Nursery, click here to see. C. Colston Burrell and Judith Knott Tyler, Hellebores a comprehensive guide, 2006, Timber Press. The most recent book on Hellebores, recommended. Still the definitive botanical monograph on the genus. Unfortunately has been out of print for many years. Hard to find. Still available I think. A good general guide to the genus. Small but good paperback guide to Hellebores and still available. Also out of print I believe.